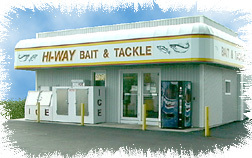 Welcome to the Hi-Way Bait, Tackle and Lodging Home Page. Centrally located in the walleye & small mouth bass capital of the world! Port Clinton, Ohio, near the Lake Erie Islands. Offering a wide selection of fishing tackle, rods and reels, lures, live and frozen bait, beer, wine, snacks, ice and much more. Conveniently located to many launch ramps, parks, restaurants, shops and some of the best Walleye, Perch and Bass fishing Lake Erie has to offer. We can help you plan the perfect 'Fishing Retreat' by not only offering a large supply of bait and tackle, but overnight accommodations for up to 8 people, a large listing of available charter boats, and the much needed current fishing tips and hot-spots! For delicious local dining with friendly service, visit the Peninsula Restaurant, located directly next door at 6982 East Harbor Road. Serving breakfast, lunch, and dinners. And for the fisherman on-the-go, they also offer box lunches.